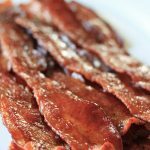 Place bacon on a metal baking/cooling rack and set on a foil lined baking sheet. Bake in a 375 degree oven for about 25 minutes, or until bacon has started to crisp. Cooking time will vary according to oven. Remove bacon from oven and brush with pure maple syrup. Bake for an additional 5 minutes until maple syrup starts to carmalize.